Corrosion free extended lifetime coloured rainbow metal wire hangers; galvanised and powder coated. Mixture of attractive colours: red, yellow, blue, green, orange, black, white, purple, gold & pink. Smooth hook end with plain silver neck and coloured tip. Useful for colour coding if needed. Ideal general use hanger for shirts, blouses, trousers, skirts, dresses etc. Shoulder notches for added versatility. Squared neck shape for better presentation of garments. Neck length of hanger suitable for use by dry cleaning companies. Made from 13 gauge steel (stronger than 13.5 or 14 gauge). Size: Width 40cm (16 Inches) approx. 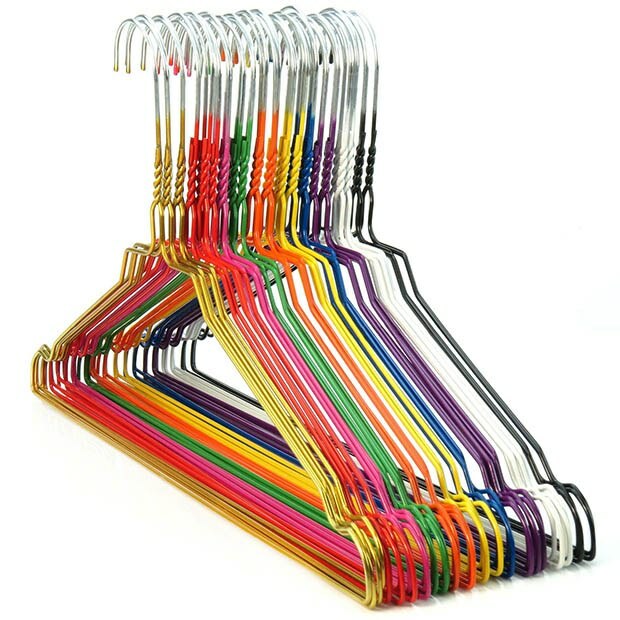 Standard wire hangers, good quality, make the wardrobe look better. Ideal for someone who likes things even more organised than otherwise possible, or just identifying garment owner.